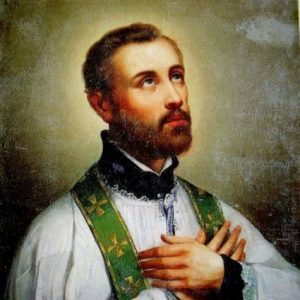 St. Francis Xavier was a Jesuit priest, a scholar, and one of the greatest missionaries in Church history. Francis was born in 1506 in the Xavier castle near the city of Sanguesa in the Navarre region of Spain. His father was the king’s counselor, and his mother was an heiress to the Xavier family estate. The family was Basque, and Francis was the youngest child. He was a gifted student and loved to study and learn. When he was nineteen, he went to the University of Paris, where he studied philosophy and theology. In 1529, Francis met [St.] Ignatius of Loyola, who was also at the University, and the two became friends. The following year, Francis earned his master’s degree and took a position teaching Aristotelian philosophy there. Ignatius and Francis began to meet to practice Ignatius’s spiritual exercises, and five other men joined their group. In 1537, Francis, Ignatius, and several others were ordained priests at Venice, and Francis went to Bologna to continue teaching. During the spring of 1539, Ignatius called together his companions at Rome, and the group, under Ignatius’s leadership, decided to form a new religious order, the Society of Jesus. These were the years that the Protestant Reformation was underway in Europe, and the men made fidelity to the Pope one of their primary vows. In 1540, King John III of Portugal requested two Jesuits to be sent to Goa, India, where a Portuguese colony had been established. 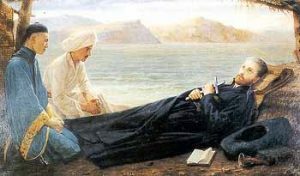 Although Ignatius had planned to use Francis’s intellectual gifts as a university teacher, when one of the brothers became ill, he sent Francis and another Jesuit, Simon Rodriguez, to Lisbon. There, the King requested that Rodriguez remain, and Francis spent nearly a year helping with the needs of schools and hospitals. 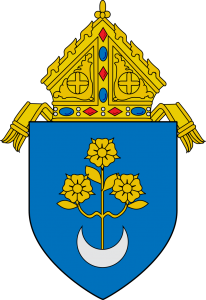 In the spring of 1541, Francis left for Goa, carrying documents from Pope Paul III verifying his status as papal nuncio to the Indies. During the long months of the voyage, Francis befriended and evangelized the ship’s crew. Thirteen months after departure, Francis arrived at Goa. There, he spent five months evangelizing, especially to the children, as well as visiting the sick and imprisoned. He had much work to do to convince the Portuguese of the immorality of keeping concubines. He moved on to the southernmost coast of India, where he spent three years ministering to the Paravas, a low caste people, who had just been introduced to Christianity. There, he baptized thousands of people. He also became known as a man of miracles, even bringing two dead people back to life. In 1547, Francis stopped at Malacca, a part of present-day Malaysia. 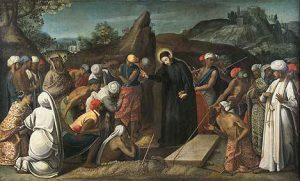 He evangelized at the Moluccas, an island group in present-day Indonesia. He baptized a man from Japan, a land unknown to Francis. Together, they went to Kagoshima, Japan, where Francis studied the language and translated some key documents pertaining to the Faith into Japanese. He went to numerous places in central and southern Japan, spreading the seeds of faith. In 1551, Ignatius named Francis the Jesuit Provincial of India and the far East. Francis left Japan to return to India, intent on going to China to bring the Faith there. In the spring of 1552, he left Goa and several months later he arrived at Sancian, a small island off the southern coast of China, which had been established as a Portuguese base. There, he was devising a plan to enter China, a nation of enormous size and challenge. An illness he had contracted while at sea became worse at Sancian, where he was living in a small primitive shelter. He died there at age forty six, without benefit of the Sacraments or a Christian burial, alone except for a Chinese teen named Anthony. Despite the fact that his body was covered with lime to hasten decomposure, it was found to be incorrupt and pleasantly fragrant when discovered the following year. It was taken to Goa, where it was met with much grateful affection and was interred at the Jesuit church there. 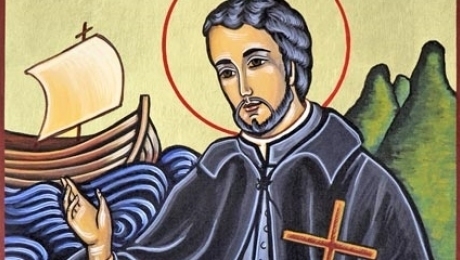 St. Francis Xavier’s evangelization method was brilliantly simple. He would gather the children and those adults who were unoccupied in each village. He taught them the Creed, the Ten Commandments, and the Lord’s Prayer. He would walk through the village ringing a bell to call his pupils, and used songs and poems as teaching methods. When they consented to what he was teaching, he baptized them. In India alone, he baptized at least thirty thousand people, and all told, the number would be in the hundreds of thousands. He was a true intellectual who could have had a comfortable life teaching at universities, but was willing to use his considerable gifts unselfishly to bring a great harvest to the Lord. His reported miracles were countless, and include curing sick and wounded, raising people from the dead, and calming storms at sea. He was known to bilocate so often, it became almost commonplace for him to do so. He genuinely loved his people, and conversions were won because people instinctively knew he was sincere. He traveled thousands of miles, often alone, entering remote areas, with precious little financial resources. In addition to prayer, he gained much encouragement from correspondence with his Jesuit brothers in Europe. Without doubt, he was the greatest Christian missionary since St. Paul the Apostle. 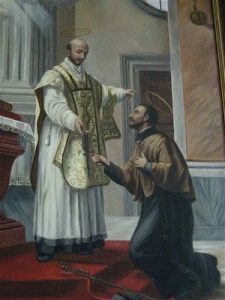 St. Francis Xavier was canonized in 1622 along with his friend Ignatius of Loyola, as well as Teresa of Avila and Isidore the Farmer. He is the patron of all foreign missions, as well as dozens of other nations, groups, and causes, including Green Bay, Wisconsin and Indianapolis, Indiana. His feast day is celebrated throughout the Catholic world on December 3.